Western blot analysis of extracts from various cell lines using KCTD5 Antibody (upper) and β-Actin (D6A8) Rabbit mAb #8457 (lower). Immunoprecipitation of KCTD5 from RPMI 8226 cell extracts. 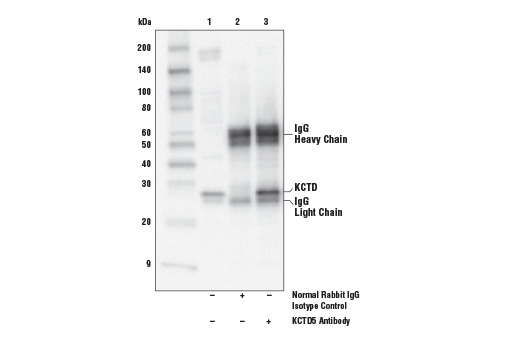 Lane 1 is 10% input, lane 2 is Normal Rabbit IgG #2729, and lane 3 is KCTD5 Antibody. 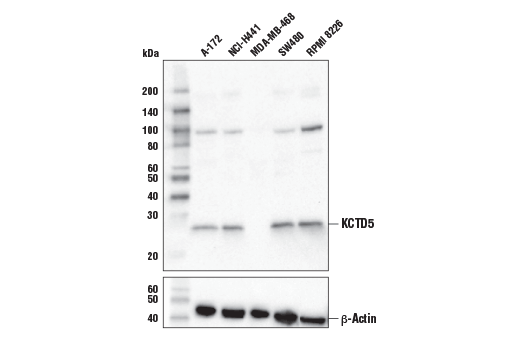 Western blot analysis was performed using KCTD5 Antibody. KCTD5 Antibody recognizes endogenous levels of total KCTD5 protein. In some cell lines, this antibody also recognizes a 100 kDa band of unknown origin. Polyclonal antibodies are produced by immunizing animals with a synthetic peptide corresponding to residues surrounding Arg38 of human KCTD5 protein. Antibodies are purified by protein A and peptide affinity chromatography. BTB/POZ domain-containing protein KCTD5 is a member of the potassium channel tetramerization domain family of proteins that play a role in transcriptional repression, cytoskeletal regulation, and ion channel gating (1). KCTD5 interacts with bound ubiquitin proteins and cullin3, and acts as a dependent E3 ligase substrate adaptor through interactions with its BTB domain (2). KCTD5 has been identified as a negative regulator of the AKT pathway by acting as an off switch for G-protein coupled receptor signaling by triggering proteolysis of Gβγ heterodimers dissociated from the Gα subunit (3). Liu, Z. et al. (2013) Cell Biosci 3, 45. Bayón, Y. et al. (2008) FEBS J 275, 3900-10. Brockmann, M. et al. (2017) Nature 546, 307-311.